Our goal is to bring simplicity and efficiency to all players in the wine industry by giving a single score aggregated from many expert ratings. This allows for the easy comparison of wines made from different grapes and from different regions around the world. Here we will explain the purpose of The Global Wine Score and our calculation methods. Critics have different tastes, different palates, different indulgences and different rating scales. Even when using the same scale, two experts rating the same wine rarely give the same score. To develop a consensus score, we need to adjust for each critic’s unique tastes and scoring methods. From the old world to the new world, the wine industry is growing and vines are making their way to new corners of the world. Each region has different soils, grape varieties, viticultural and wine making techniques, which yield unique styles of wine in each region. To assess wines from a specific region, a critic needs the ability to sense the slight nuances contained in a glass of wine that can only come from experience with the region. Unfortunately, it is impossible for a critic to be an expert in all of the world’s wine regions. In reality, each region has its own specialist pool assessing wines based on their in-depth knowledge of the region and its wines. However, this means that wines from different regions are rarely rated by the same pool of critics. 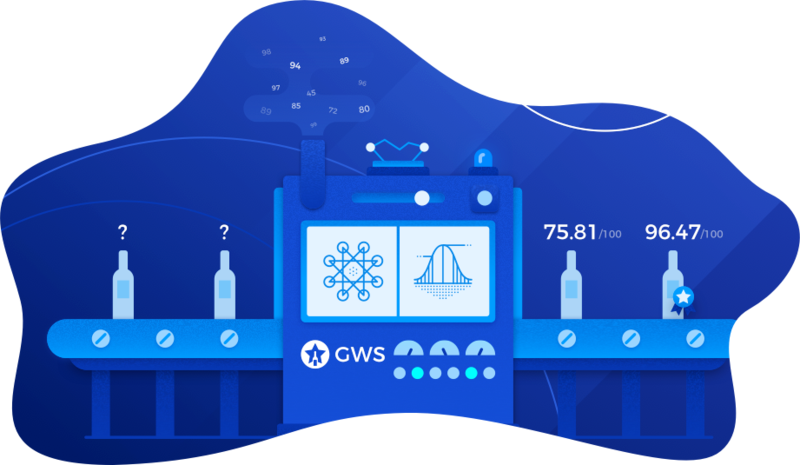 In order to create a fair comparison across regions, our team of mathematicians, data scientists and above all, wine lovers, developed a complex proprietary algorithm to solve these issues. We normalize this heterogeneous data coming from different critics so that scores are comparable between critics. Let’s consider 2 experts with different rating habits: Critic A is strict and gives very few good ratings, while Critic B is more generous. In order to summarize their different points of view, we analyze the Cumulative Distribution Function (CDF) of their ratings. For non-mathematicians, the CDF of an expert represents the percentage of wines rated below a given level. For example, the strict expert would rate 80% of the wines below 89, the nicer one below 94. With this normalization method, we can then perform a projection from any expert to another. 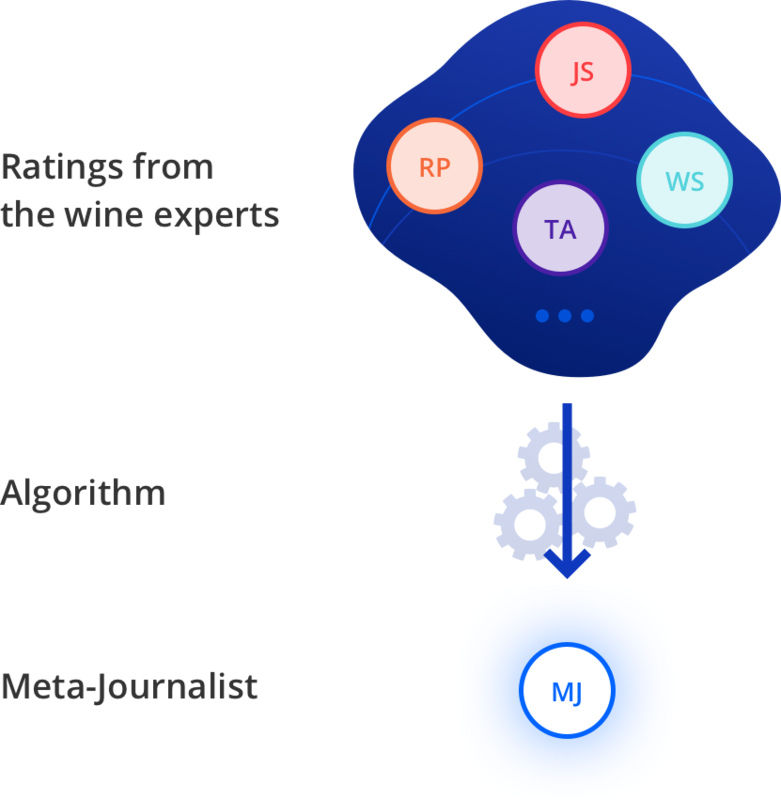 Since there is no journalist that has tasted all of the world’s wines, our algorithm constructs a fictional “referent” journalist — the meta-journalist — who has scored all wines based on the real journalists ratings. All of the ratings from the wine experts are converted to the meta-journalist scale (the Robert Parker 100-point scale, the most common scale used globally) by following the normalization process outlined above. Once all ratings are normalized and put on the same scale, the Global Wine Score is calculated by averaging each critic’s normalized score, giving equal weight to each critic. We do not give more weight to any specific critic since we utilize journalists from all over the globe. For example, certain French journalists are very influential within France but are largely unknown to consumers outside France. Likewise, some English or American critics have a strong influence in their respective countries but little influence on foreign consumers. At Global Wine Score we combine all of these opinions into a single, unbiased score, and therefore it is important that we give each critic an equal weight in our calculation to reflect the diversity of opinions of wines around the world. Additionally, a minimum of 3 ratings is needed to generate a Global Wine Score to ensure the score is suitable for comparison. Since many wines are re-tasted by critics as they age, The Global Wine Score is constantly updated to include the new ratings received for a wine. On our website, you can view the evolution of The Global Wine Score of a wine as it ages and is re-tasted by critics at various stages. For more in-depth analysis of The Global Wine Score, check out our blog that is updated regularly. To see Global Wine Scores for your favorite wines and compare scores, see our rankings page.